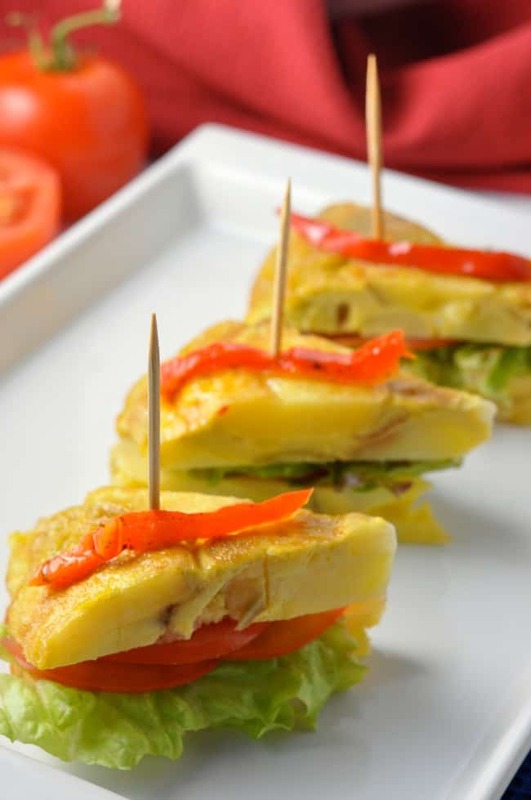 Tortilla Española or Spanish Tortilla is a traditional Spanish tapa, ideal for breakfast, lunch or a light dinner! This is a simple 4-ingredient recipe that always turns out. *This post was originally published in 2015. I have updated it with new photos and tweaked the recipe instructions. We’re back! After 5 weeks traveling (and eating) our way through Portugal and Spain and almost a week recovering from jet lag, I’m full of ideas to share with you. Images of the food we ate, from paella cooked over an open fire on the beach to chocolate dipped palmiers, are swirling in my mind. 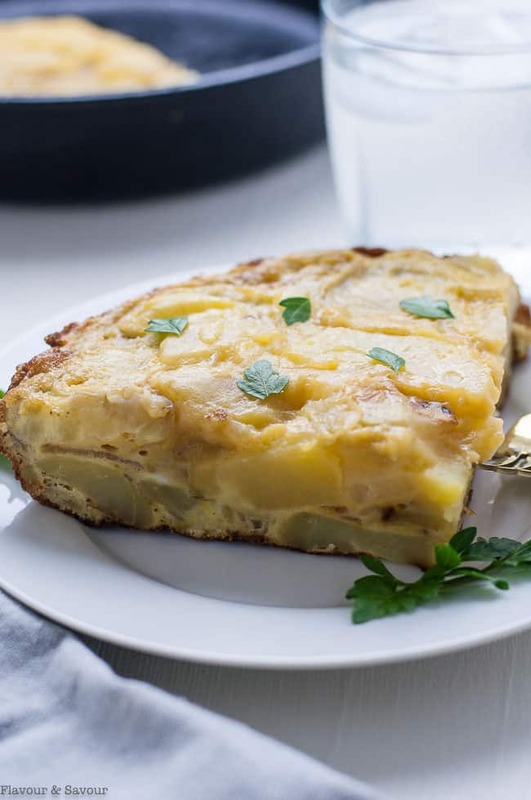 Today is all about tapas, however, and particularly about the most traditional tapas of all: Tortilla Española, also known as Spanish Omelette. 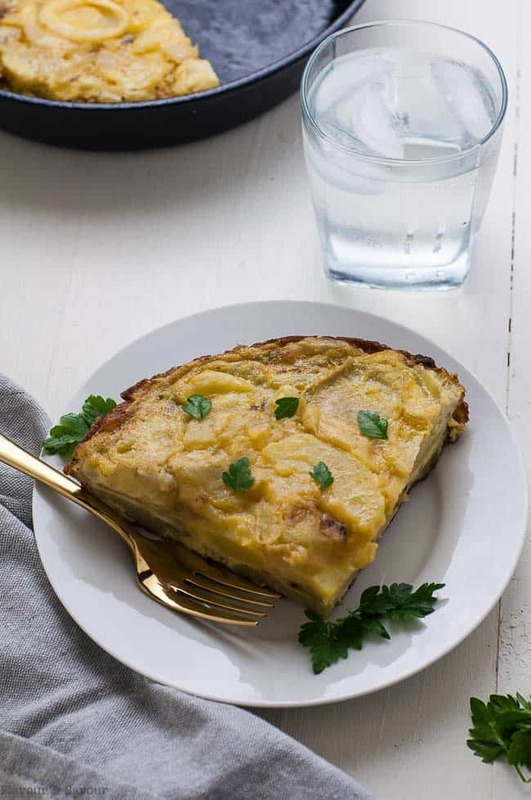 Tortilla Española is nothing like a Mexican tortilla. It’s more like a fritatta, but one hundred times better. In years past, it was a simple dish made with eggs, potatoes and onions, served cold, and was something a shepherd could wrap in brown paper, shove in his pocket, and save for his lunch. 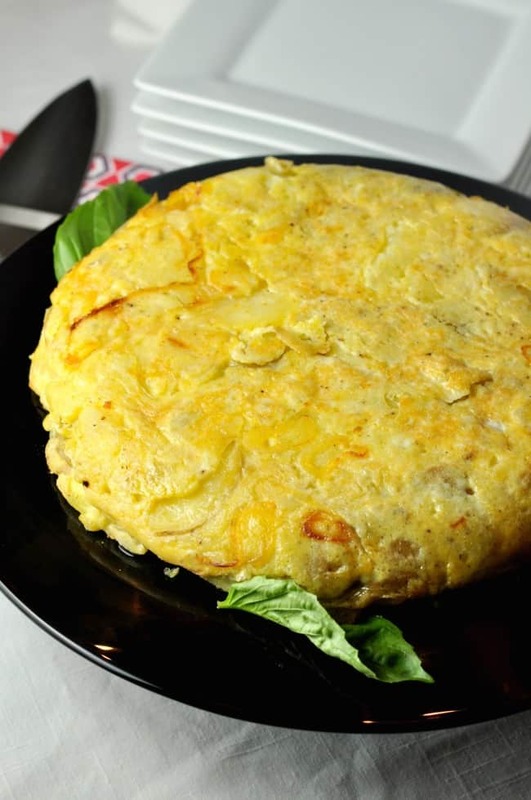 We found Tortilla Española on the menu in every bar or restaurant we visited in Spain. Some versions were simple, made with just those three ingredients. Other chefs took it up a notch, splitting it and stuffing the center with sliced tomatoes, lettuce and a creamy aioli or topping it with Romesco sauce. 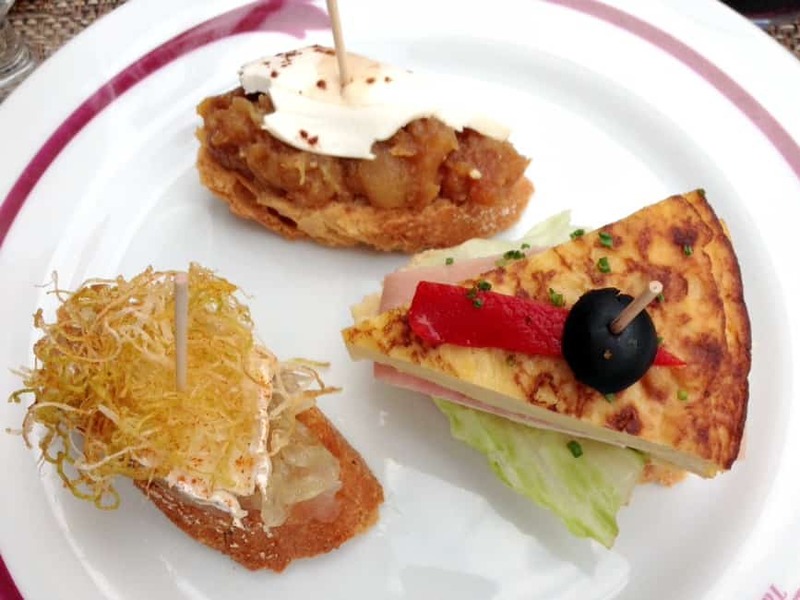 Tapas–those small bites served in Spanish bars and restaurants from early evening to all hours of the night–have to be the best way to eat. I’m convinced I could have those sharable little morsels every day and never tire of them. They’re a great way to serve a crowd at your next gathering, too. No cook wants to be stuck in the kitchen all night–unless you’re having a tapa party, that is. I’m planning a couple of parties and will invite my friends to hang out in the kitchen with me, or better still, I may even put them to work assembling these fun morsels. Providing a variety from which to choose insures that even my guests with allergies or dietary preferences will be looked after. Tapa in Spanish translates to “cover.” Historically, a small piece of bread was used to cover the top of a wine glass to prevent flies from getting in. Those days are gone, and Denis and I found the tapas scene to be evolving too. 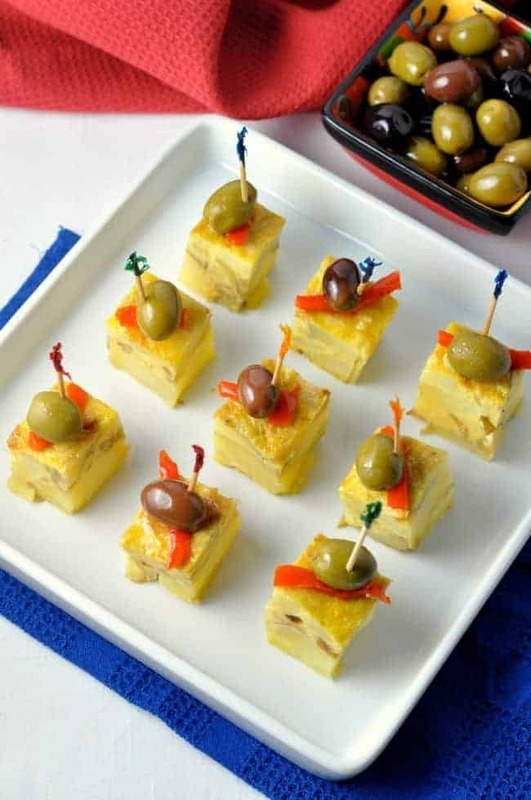 In some parts of Spain, most tapas were simple bites, maybe a slice of baguette with some Manchego and Iberico ham on top or simply a small dish of olives. In other tapa bars, however, notably in Seville, Barcelona, and San Sebastian, eating tapas was definitely an upscale gourmet experience. And in the name of research, we popped in to several tapa bars. We were a little unsure just how to order these, but we were determined to figure it out. 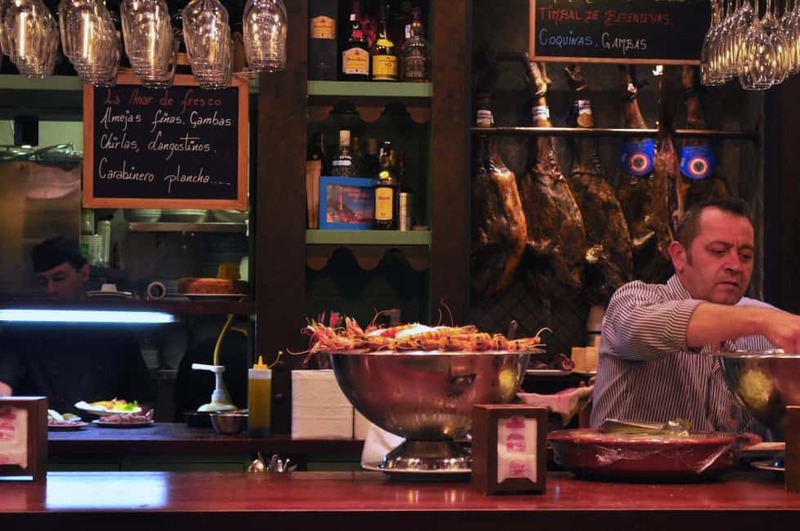 With our limited knowledge of Spanish, but armed with a “can-do” attitude, we made the plunge into the first one and soon developed the confidence to take on the tapa bar world. 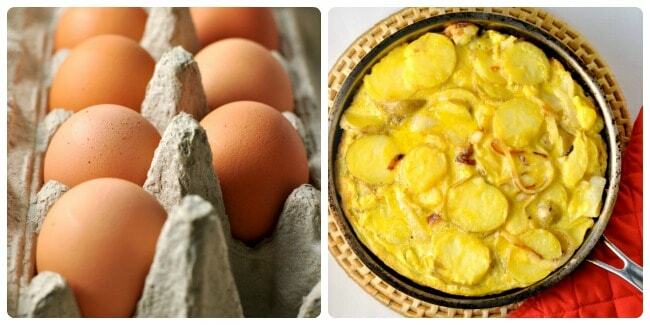 This recipe for Tortilla Española is quick and easy. It never fails. I have made it many times, for breakfast, for lunch, and even for a light dinner, and it always turns out perfectly. Simply cook the potatoes until just tender, slice them, sauté the onions, whisk the eggs, add a little salt and mix it all together. Pour into a preheated ovenproof skillet with a generous amount of olive oil, let it set just for a minute, then bake in the oven. When it is done, invert a serving dish over the skillet and flip the skillet over. 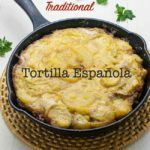 The tortilla will release easily and should slide right out. 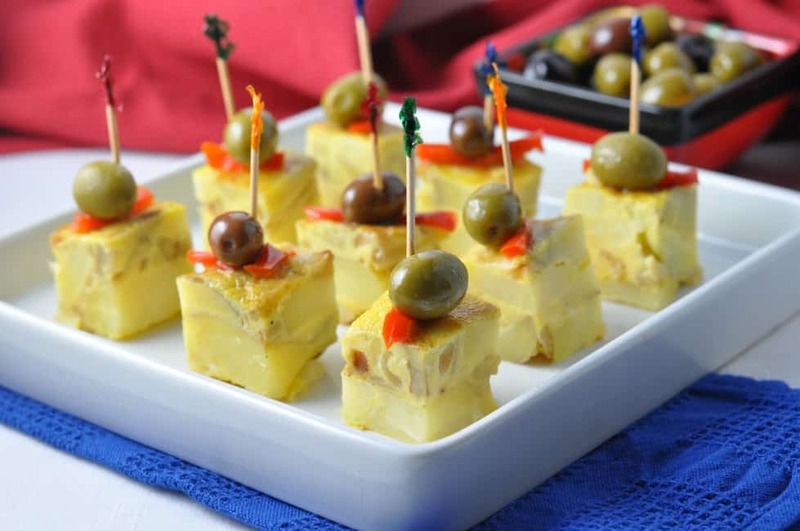 I’ve adapted this recipe to make smaller bites that would be perfect to serve at a tapa party where guests will likely want to try everything without overeating. 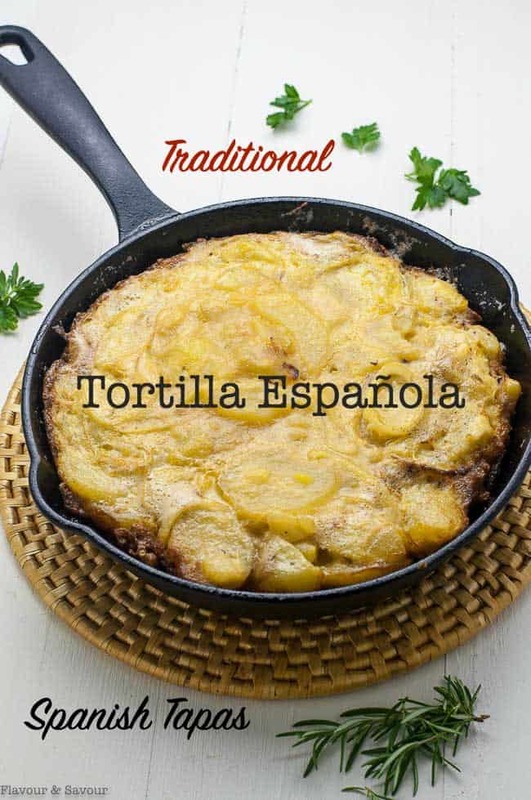 Tortilla Española--the most traditional Spanish tapa is quick and easy to make. Delicious! Peel and boil the potatoes, just until tender. Avoid overcooking or the potatoes will not slice nicely. Slice thinly. Using a mandolin slicer produces uniform slices, but it's not essential. A sharp knife will work too. Heat half of the oil in an ovenproof skillet over medium heat and sauté the onions, just until translucent but not browned. Whisk eggs in a large bowl. Add the sliced, cooked potatoes, salt and onions. Add the remaining oil to the frying pan and when hot, pour in the egg-potato mixture. Let it cook for a minute or two, just until the edges are set. Transfer the skillet to the oven and bake at 350 F. for 20 minutes or until the egg has set. Invert a serving dish over the frying pan and flip the frying pan over. The tortilla will release easily. Allow to cool. Slice into wedges or small squares and serve at room temperature. That must have been a wonderful trip! This looks like a great gluten-free appetizer! I’m currently living in Barcelona, love tortilla de patata! It’s true, this tapa is in every single tapas place, it’s a must try fro anyone visiting Spain and also a great dish to reproduce at home. And it’s so easy to make! We had it for breakfast and as tapas wherever we were in Spain. Love it! Elaine! These are adorable! 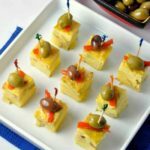 I love tapas and this got me thinking that I should really host a tapas party with my gals. Love this idea. Thanks for the inspo! Tapa parties are the BEST! There are so many choices that there is always something for everyone. 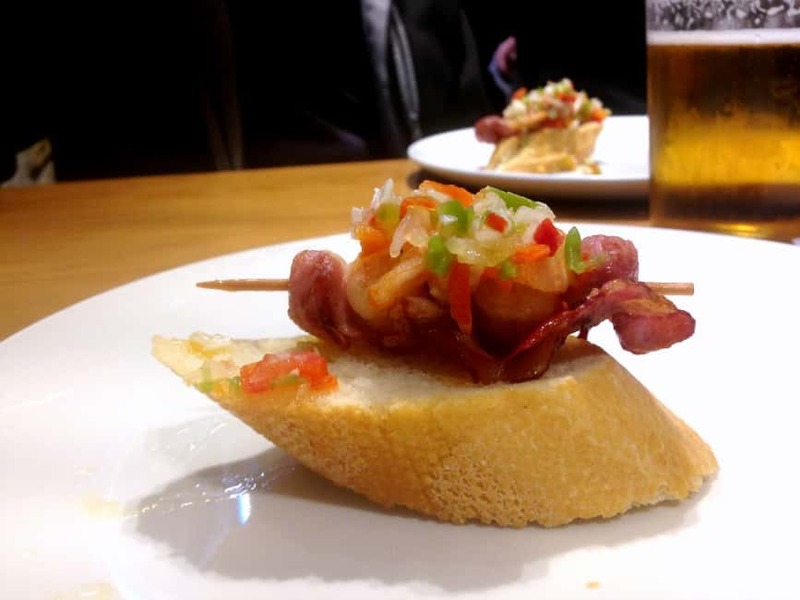 I had the opportunity to experience some great tapas dishes while in Barcelona. This recipe will be on my to make list and I’m sure we it will bring back some memories. Thanks for sharing. Sounds very similar to an Italian potatoe frittata and actually a favorite of mine! Looks and sounds so delicious. It’s a favourite of ours!